I have a tendency to overdo it with presents. I get it from my mom, “Just one more little thing to open, you know…just cause.” Which means even though I think I am done with my Christmas presents, I’m really not. But who wants to go out into the madness of the shopping malls and centers at this time of year? Not me! You know what that means. Yep, I am casting on something. I found this pattern for mini socks in a past webletter. They are small, quick and simple. Perfect! 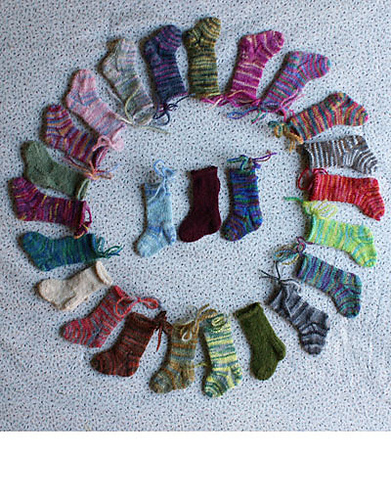 Each “sock” only takes about 20 yards, so you can get lots of socks from a single skein of Alpaca Sox (available in Solids, Kettle Dyes or Hand Dyes) or Liberty Wool Light. 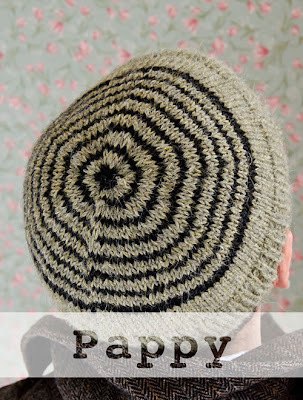 I hoped over to Ravelry to see what some of you have done with this pattern in the past and there are lots of great ideas. I saw it used as a gift tag with the person’s initial on it, as an ornament on trees, as an advent calendar on a garland and even as doll socks. 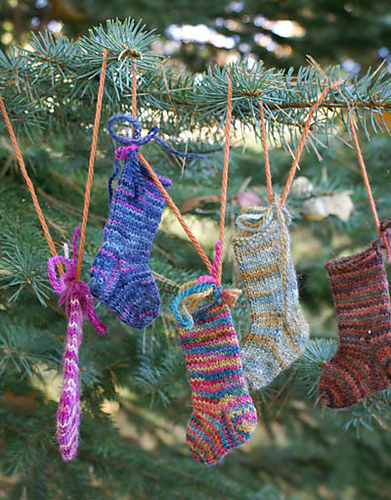 Although there are only 3 knitting days left to Christmas, you still have time to make a few of these. 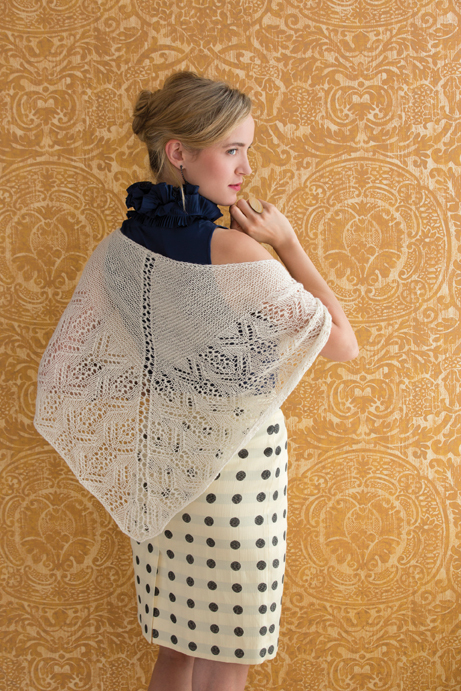 Classic Elite Yarns and Sixth & Spring Publishing have teamed up to create Shawls, Wraps & Scarves. 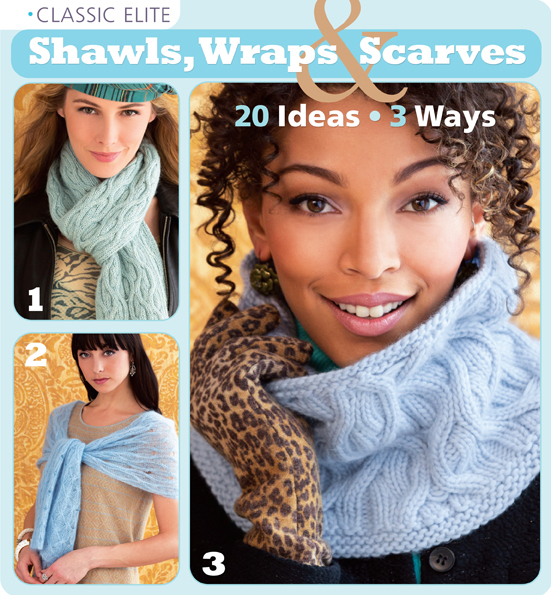 This book features 20 ideas for shawls, wraps and scarves, each one done three different ways, which equals 60 possibilities. The book features patterns by 17 different designers including Susan Mills, Nitza Coto, Carol Sulcoski, Linda Medina, Anastasia Blaes, Carolyn Noyes, Holli Yeoh, Brooke Nico, Jean Moss, Tonia Barry, Jacqueline Van Dillen, Jill Gutman Schoenfuss, Irina Poludnenko, Angela Tong, Cheryl Murray, Helen Bingham and Anniken Allis. One of the great things about these ‘small’ projects is chance to learn new techniques without committing to a huge project. Looking to learn cables? 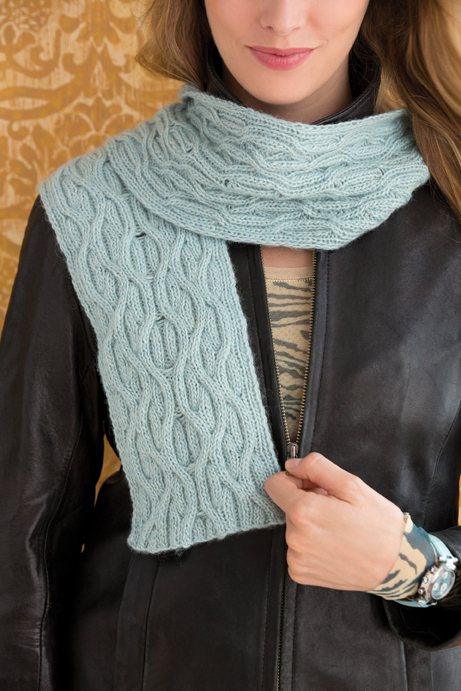 The Power Cables patterns incorporate a reversible cable to make a scarf, cowl or shawl. 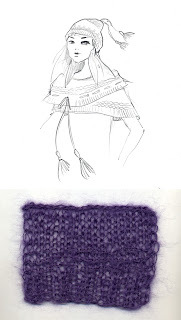 Using different yarns (Woodlandand Pirouette), each project has its own character. How about lace? 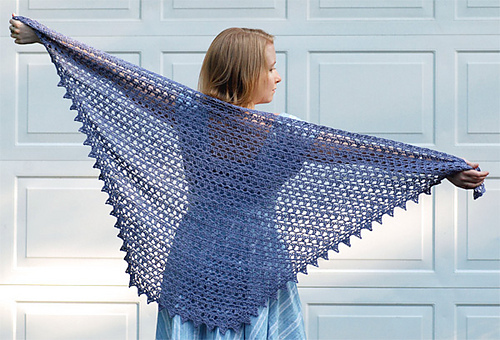 The Cream & Sugar patterns include a cowl, a rectangle wrap and a triangle shawl. Using lighter weight yarns (Pirouetteand Vail), these lace projects create great layering pieces that can be worn year round. 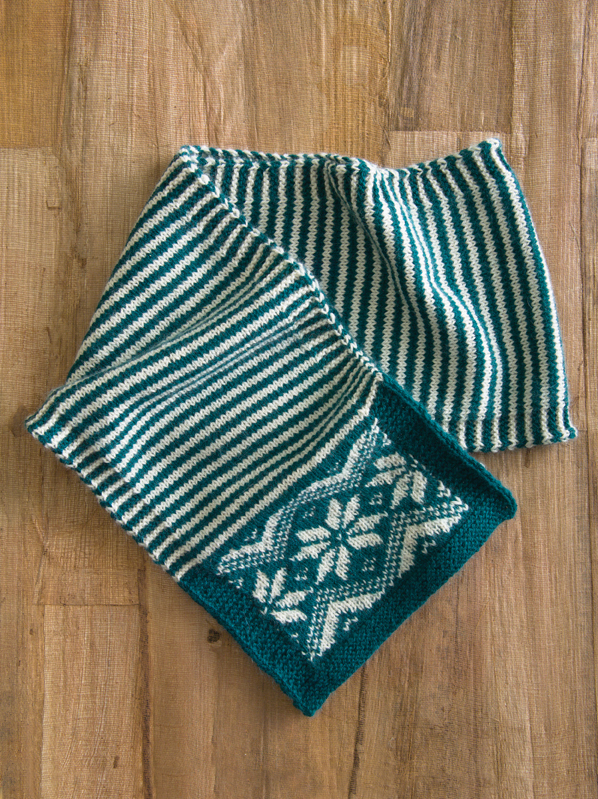 The words Fair Isle can strike fear in many knitter’s hearts. 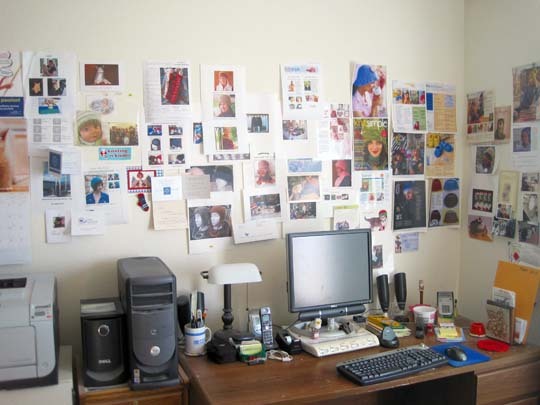 But using the Nordic Star patterns you can incorporate as little or as much as you would like. Shawls, Wraps & Scarves is available in local yarns stores now. You can also purchase a copy online here. 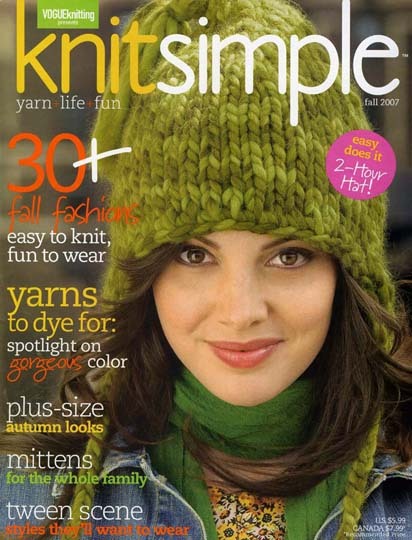 It would make a great gift for any knitter in your life, whether they are a new knitter or an advanced stitcher. All photos courtesy Sixth & Spring Books; photography Jack Deutsch. It happens every year. There is someone who you don't normally exchange gifts with, but they pull the ultimate surprise on you while having lunch or at a holiday get together. I like to have a backup plan in place at all times and keep something already wrapped in my desk or in the car for such occasions. 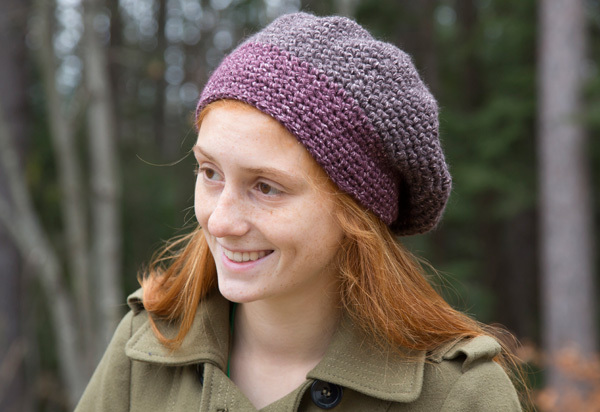 Our Lowell Cowl is the perfect solution. The recipient will be so impressed that you knit them something. 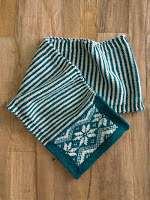 They don't need to know that the cowl is made of a simple 'mistake' rib and garter stitch in the round on larger needles. 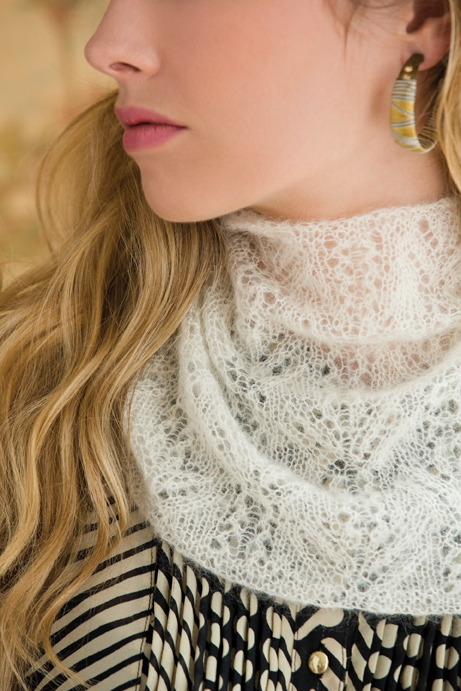 The Lowell Cowl is made with two different colors of Silky Alpaca Lace held together. It is sophisticated and practical at the same time. The silk in the yarn gives it a beautiful sheen, while the alpaca will give it a nice halo and lots of warmth. It will be an accessory the recipient (or yourself) can wear year round. 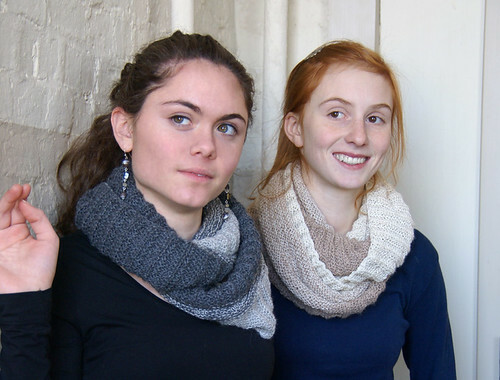 The cowl can be worn several ways - a single loop, a double loop, as a shrug or even as a short scarf. 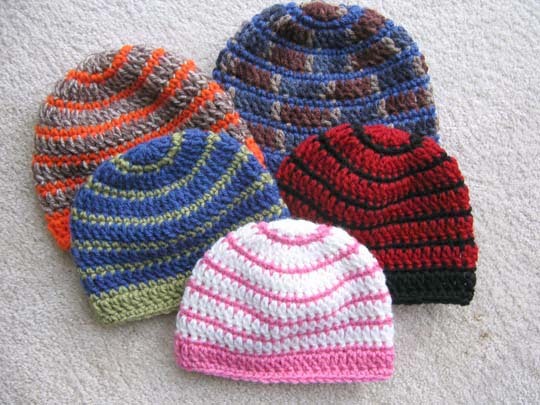 With lots of solids and multi-colors available, the possibilities really are endless. 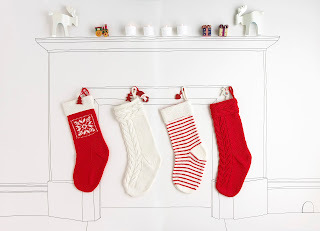 The days are getting shorter and with a chill in the air, it can mean one thing only...the holidays are closing in on us and our knitting time is running out. 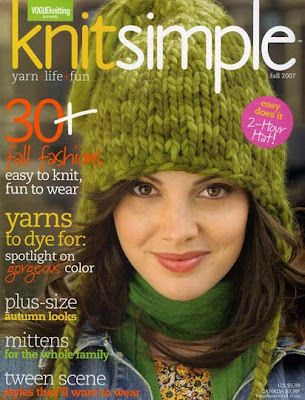 So what is a knitter to do? It has to be fast and yet dramatic. The answer is simple. 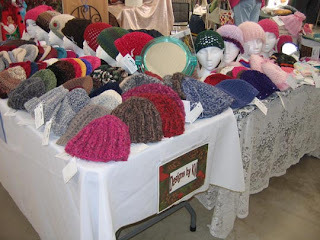 Hats, and in a chunky yarn. 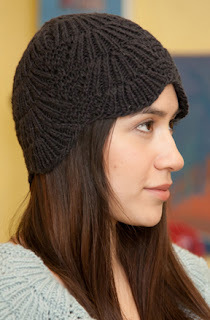 The Shadow Toque from the Fall 2011 Interweave Knits is the perfect solution. 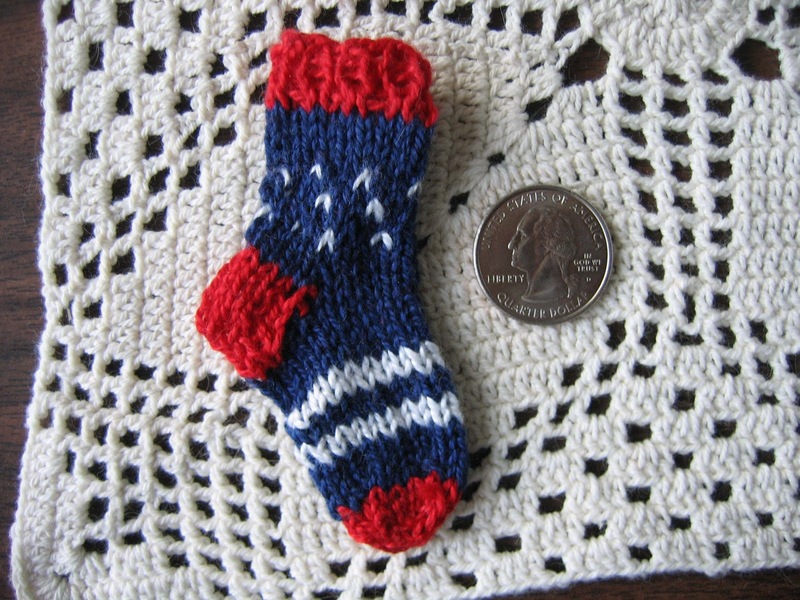 Knit in Tobbogan at 3 stitches per inch on US 10 ½ needles it works up quickly. The cable detail makes it special without making it too difficult. Tobbogan is a wool and alpaca blend, so you know it will be very soft to work with and keep the recipient’s head warm during the winter months to come. Taking only 1 skein and available in 21 colors, you can knit one for everyone on your list, whether they were naughty or nice this year. 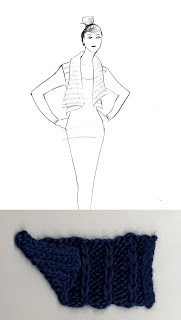 A second skein will enable you to make a big fluffy pom pom for the top, the design detail of the season. 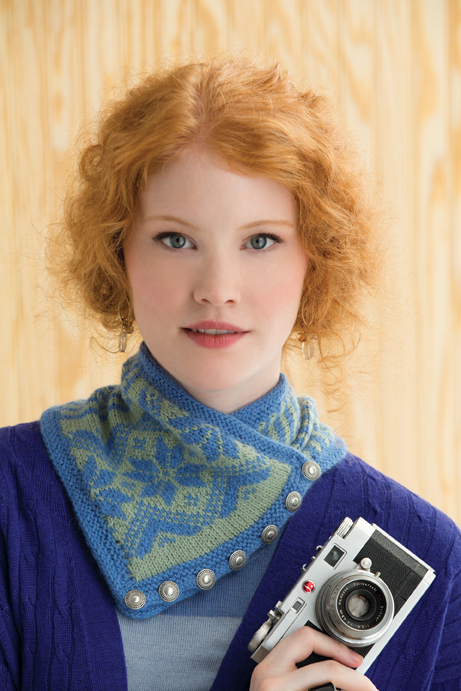 Purchase your copy of the pattern on Interweave’s website here. Photos courtesy of Interweave Press, Carmel Zucker, photographer. We had such fun hearing from Laura Zukaite in October of last year that we thought we'd let you read about her design process again. Look for another great design from Laura in this week's Web-Letter. Laura Zukaite is an independent knitwear designer with an impossible-to-miss style and yen for luxury fibers and sophisticated looks. Her patterns are often thoughtful and well designed, with feminine details and a touch of the unexpected. 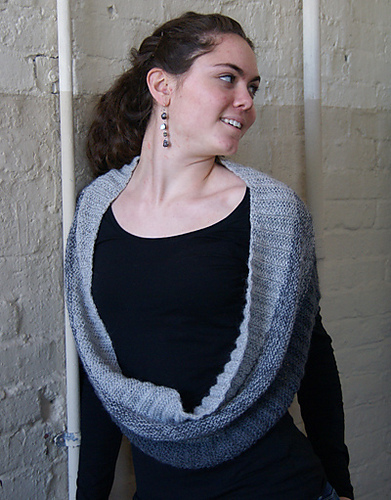 Take a look at the Magnolia Swirl Cowl, a free pattern published in our weekly Web Letter. It is a tapered cabled strip that is joined in a coil of sorts, not with regular seams, but with a spiralling silk ribbon, integrating the finishing into the design. 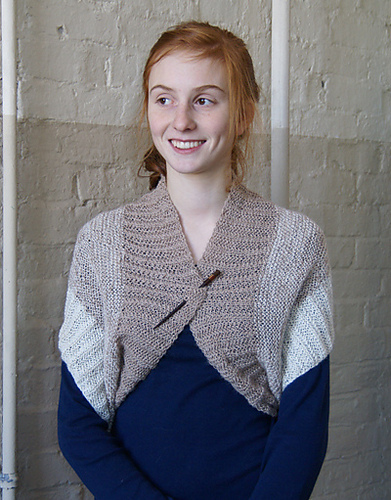 Laura is already familiar with Magnolia, having used it in her Golden Girl Cardigan, another clever, feminine piece from her independently published collection at LauraZukaite.com. 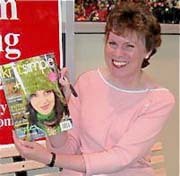 She is the author of two books, Luxe Knits and Luxe Accessories, both featuring sophisticated designs in luxury yarns, and is also a frequent contributor to various online and print magazines, like Knitting, Vogue Knitting, and Knitty. 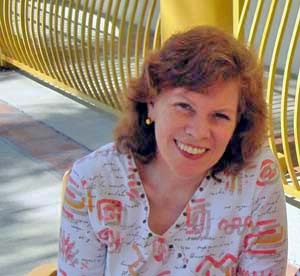 She was kind enough to do an interview with us here at the blog. I have been knitting since I was five. All of my knits and later sweaters came out of just my imagination. Back then I never thought of what I was doing as "designing". But now when I think about it- I was designing all along. Actually, I do not remember. As far as my memory goes, I have always been knitting. My mother is an excellent knitter, so I assume that she taught me somewhere along the way. 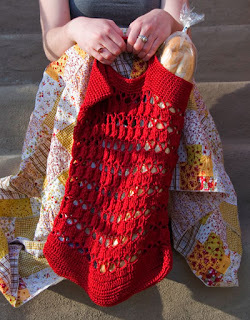 But I do not have a recollection of my first project or yarn that I used. I think that the first piece that I have intentionally designed was when I was about 14 or 15. My mom bought me a cone of a beautiful Gray Heather Alpaca yarn and I knit myself an Aran Turtleneck. I still have it and wear it to this day: it became my favorite skiing sweater. What pieces did you design in the Fall Collection? 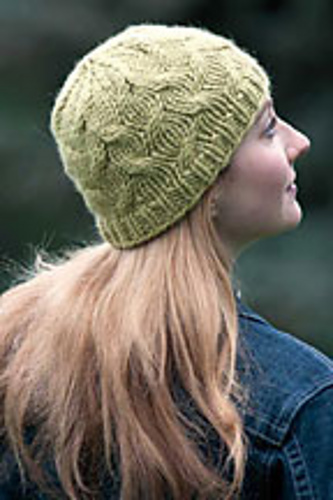 For CEY Fall Collection I have designed two pieces in Kumara: Afternoon Light (off-shoulder top) and Landscape (ribbed hat), a piece in Ariosa: Glacier (ribbed cardigan), and an accessories set in Giselle: Merry and Bright (Hat and Cowl). 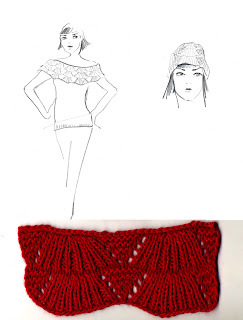 Depending on a complexity of a design- it could take anywhere from one to three weeks to turn around a sweater piece. I usually start with the yarn and swatch. After I have the fabric created- then I move into sketching. I usually sketch-up a few ideas for one swatch and then pick my favorites. After that, I select colors and start the knitting process. I like to take notes as I knit and write the pattern afterwards. I usually design at home and execute “on-the-go”. But sometimes I would come up with ideas while just walking around and then only put it on paper when I get back to my studio. I knit pretty much anywhere (subway, train, waiting for doctor’s appointment…etc) but rarely at home. What is your favorite piece you designed for the Fall Collection? What was your inspiration? My favorite piece is Afternoon Light (off-shoulder top) in Kumara. I remember at that time I was obsessed with subtle little ways of exposing the skin- and the piece just came to life naturally. It has been an indie-designer week here at CEY. On Monday we highlighted our favorite designs in the new fall magazines and then Tuesday our Web-Letter featured indie designs available online. 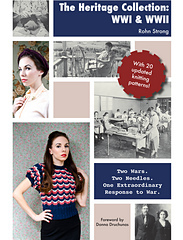 Today we celebrate indie designers with a guest post from Rohn Strong about his new book, The Heritage Collection: WWI & WWII. The book not only has 20 vintage-inspired designs (enough to pique my interest! ), it also includes essays and stories about the period. 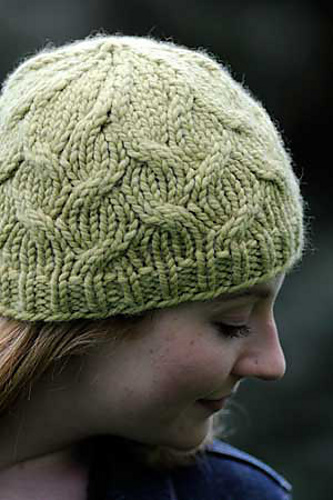 Four of Rohn's designs feature our yarns, read on to learn about how he made the pairings. When I began writing my book, The Heritage Collection WWI & WWII, I had a vague idea of who I wanted to represent as a designer. You see, as a knitwear designer, the yarn companies are my partners. I love working with yarn companies and showing off their yarns, and having the ability to do that is truly a blessing. As the knitting process began, my assistant and I sat down to figure out who we wanted to use, and what of theirs would be best represented. 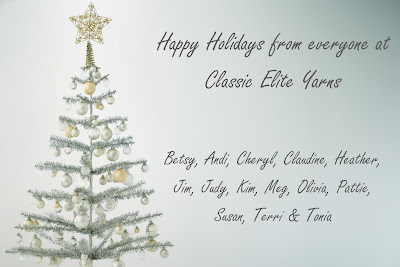 The first company I said I wanted to work with was Classic Elite Yarns. 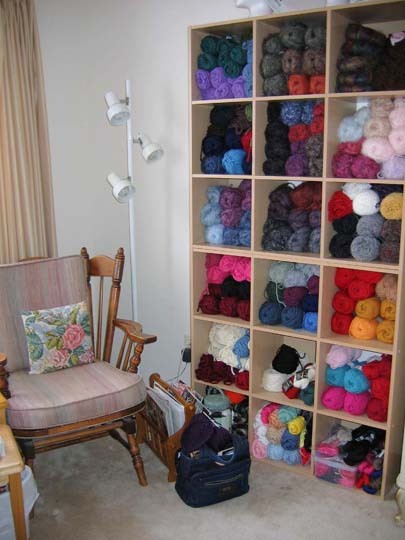 We agreed and began looking for yarn that we could use that would fit perfectly. The color palette was solid. I would not budge. We would have military colors such as maroon, khaki, olive drab, grey, and blue. I was unwilling to go outside of this color range. 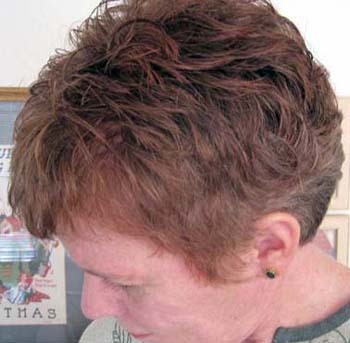 I was able to lean toward colors of the same group but nothing too outlandish. With that, the task became a bit more difficult. However, I dove in headfirst. The first yarn I chose was Classic Silk. 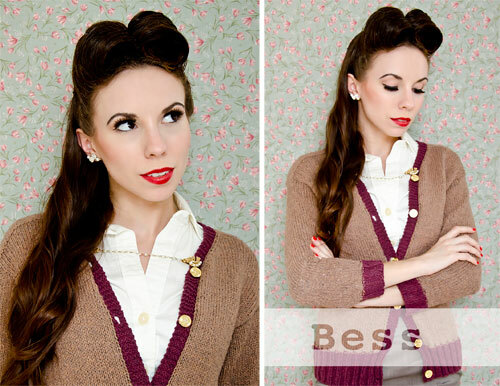 The vintage look and feel lent itself perfectly to one project I had in mind, Bess, a knit cardigan, classic in construction and technique, but modern in the overall look. I knew Classic Silk would be perfect and the colors matched perfectly. I was sold. The next yarn I chose was actually my favorite to work with, Inca Alpaca. 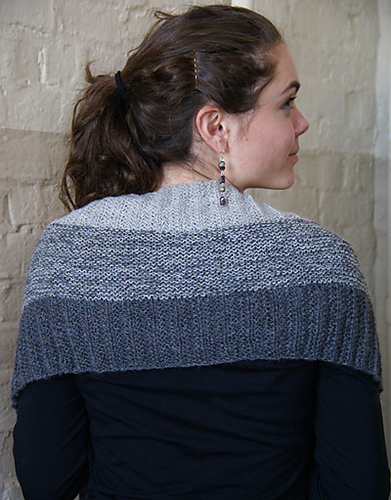 A luxuriously soft alpaca that would make you want to live in a box of it. The hand is astounding and the colors allowed every design to come together perfectly. 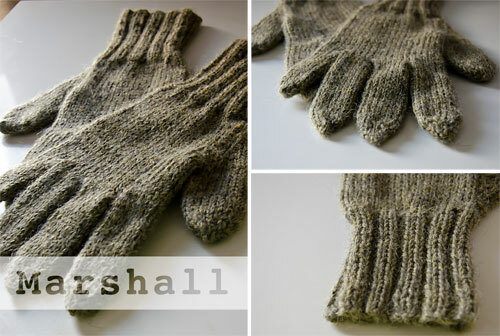 The first project I finished was Marshall, a pair of wonderful gloves inspired by a photo my grandfather had of himself. They were perfect, not the normal choice for gloves as alpaca tends to have little to no stretch. However I wouldn’t have wanted it any other way. The next project was Pappy, a simple stripped watchman’s cap perfect for warm winters! I love it! The two colors of alpaca sit perfectly together and the softness is astounding. Lastly I had the opportunity to add a project to the book based on a design by my Grandmother. A simple stripped baby sweater, knit in both Classic Silk and Inca Alpaca. The three shades of green truly add to the wonder and beauty of it all. 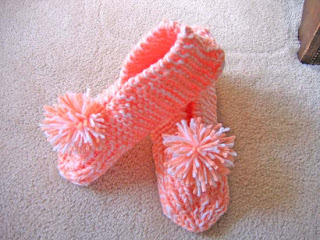 The softness and durability make it perfect for any child. 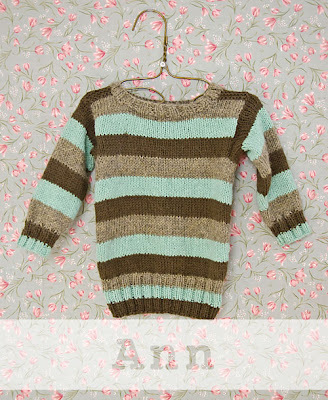 And it’s a super quick knit! 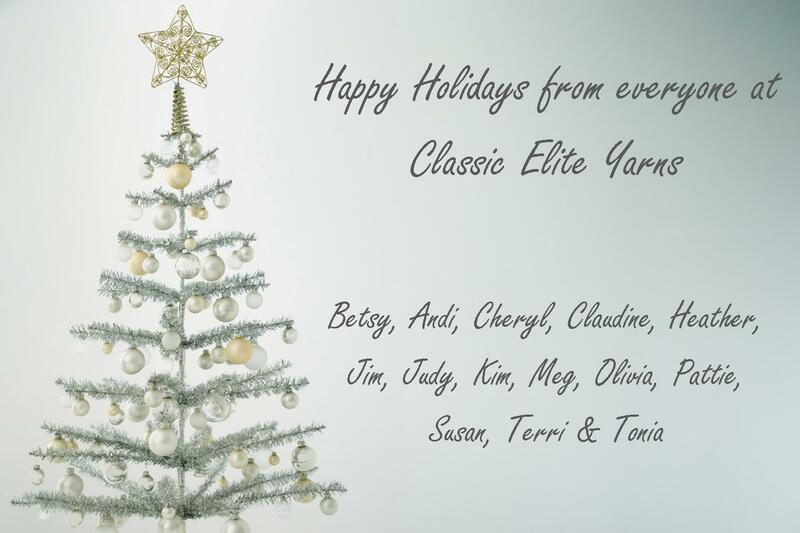 I am so proud to be part of the Classic Elite designer family. To use their wonderful yarn in my book was a great experience, and I hope to work with them again. Maybe on the next book?! We are thrilled to have Rohn join the Classic Elite designer family! More information about The Heritage Collection, including how to buy the digital and paperback editions, can be found here. To keep up with Rohn's designs and day-to-day happenings, follow him on Twitter or visit his blog.